I had a bunch of apples and squash still not spoken for on the Thanksgiving Menu, so we decided to turn this into another Thanksgiving Side Dish, knowing that the leftovers would be easily turned into a delicious soup. In fact, lots was, and it is. So add this to the arsenal. As a plus, it is very healthy and low in fat. Peel and seed the squash, reserving seeds. Mix the squash with with oil (butter) and spices. Transfer to baking dish. Cover with foil and bake for 20 minutes. Combine apples, maple syrup and balsamic vinegar. Arrange apples over the squash. Re-cover with foil, bake for another 10 minutes. Uncover the dish, stir and bake for about another 30 minutes, stirring every 10 minutes, until the squash is fully cooked and the liquid is absorbed. Check seasoning to taste. 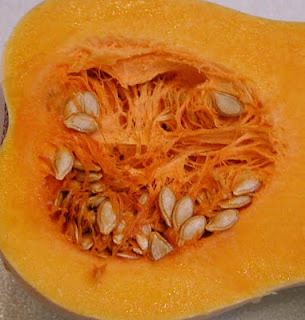 Clean the reserved squash seeds, removing anything icky. Arrange on baking sheet in one layer, and sprinkle with more curry powder, pepper and sea salt. Bake until crisp along side the squash, making sure not to burn them. Put leftovers into food processor or blender, or mash well with potato masher. Put in saucepan and add vegetable or chicken stock till it is the thickness you want. If you are very skinny or have an evil metabolism you can forget about the stock entirely and use half and half.